عندما تزور جولد كوست, ستشعر أنك في بيتك في Sanctuary Lake Apartment الذي يقدم لك إقامة متميزة و خدمات عظيمة. إن موقعه الجيد الذي يبعد فقط عن مركز المدينة يساعد النزلاء على الاستمتاع بمعالم المدينة ونشاطاتها. يشكل هذا الفندق ملاذاَ مريحاً للاسترخاء ويمنح زواره فرصة للاستجمام والتجدد، وهو يقع على بعد خطوات من المعالم السياحية الكثيرة للمدينة كمثل: Surf World Gold Coast, The Currumbin Clinic, توجون. يعمل Sanctuary Lake Apartment على ضمان إقامة مريحة لضيوفه من خلال خدماته الممتازة وحسن ضيافته. يمكن الاستمتاع بمجموعة من الخدمات على أعلى المستويات في الفندق كمثل تخزين الأمتعة, صف السيارات, غرفة عائلية, مرافق للشواء, جولات. في Sanctuary Lake Apartment غرف نوم يزيد عددها عن 20 صممت بذوق وعناية لتوفر لك كل وسائل الراحة . بعضها يحتوي أضاً على تلفزيون بشاشة مسطحة, مرآة, صوفا, غرفة معيشة منفصلة, مكيف هواء. كما أن مجموعة الخدمات الواسعة الموجودة في الفندق لضمان راحتك تترك لك الكثير من الخيارات لقضاء وقتك أثناء فترة إقامتك. إن Sanctuary Lake Apartment هو خيارك لخدمة الفنادق الراقية في جولد كوست. Have stayed here a few times and it’s always great ! Beautiful surrounds. The pool area is just gorgeous with lush gardens and bbqs. Our apartment was very relaxing had everything we needed. Surf club and beach a short walk away. There are plenty of take away places in Tugun about 10 minutes walk. Only thing was being right in the flight path of the airport, planes were quite loud. Lovely, relaxing stay.... we were lucky to get a newly refurbished room so it was beautiful and clean. The pool and the spa was amazing! The grounds are very clean and so pretty at night with the lights and the manager was very welcoming and friendly. Just across the road from the beach and a stroll up the hill is shops/cafe etc. Only thing is it's next to the airport so the planes overhead are VERY loud, but after 3 nights we just got used to them :) Would def stay again! - perfect for the kids! We couldn't have picked a better place to stay for our reunion weekend. It was close to the beach, Currumbin Creek and Currumbin wildlife sanctuary. It was also close to the International Food Fair that pop up on a Friday night with a great atmosphere and good music to dine to. The manager at Sanctuary Lakes couldn't have been more helpful and very pleasant. He always had a smile on his face. The spa and pool were very clean and perfect to wallow in after a busy day. We would definitely visit again. Very friendly staff helpful in advance with organising a late check in. I was impressed with the apartment furnishings including paintings etc. There was quite a bit of plane noise at night from the bedroom and I also will mention our pillows were as hard as concerete. It still was a reasonable stay. The first resort we have stayed at which dose not have room air conditioning just dirty ceiling fans the one in the main bedroom unbearably noisy and could not be used . Unless you are traveling with a teenager good luck with turning on the TV couldn't find instructions and the office only has someone available some of the time, there was a VHS recorder should you need it . 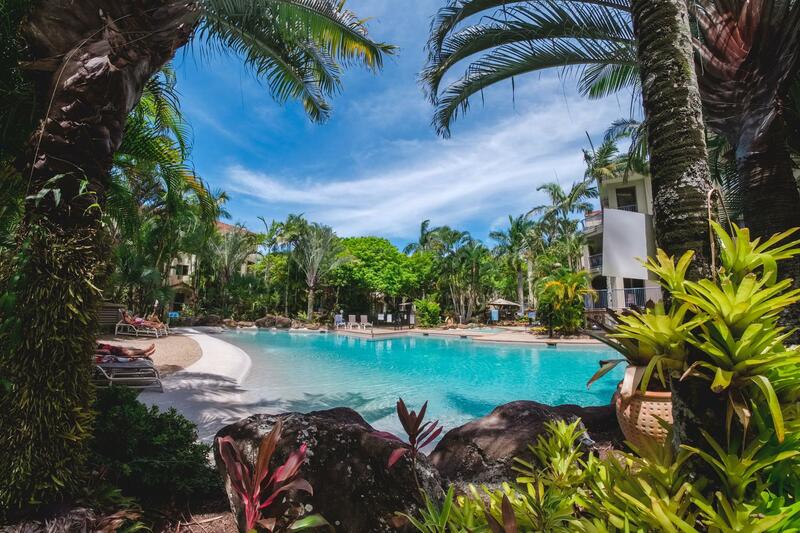 The pool is great actually the best part of the resort it also should be noted is located directly under the flight path of the gold coast airport .Yes it is handy to Currumbin Sanctuary but would I stay there again probably not . air conditioning unit too noisy. 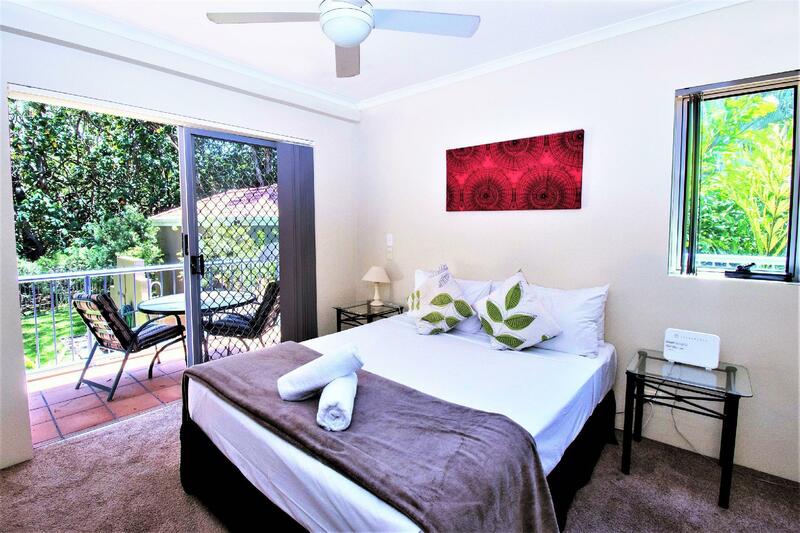 Close proximity to Currumbin beach and local eateries. Great pool for kids. Walking distance to the wildlife sanctuary. The apartment is starting to look a little dated, but otherwise was spacious and comfortable. Our stay was enjoyable. Great week with the family! A very pleasant weekend. Room comfortable and well appointed We'll go there again! 1. Great location, 2. Friendly staff. 3. Pleasant surroundings. Close to Elephant Rock for Anzac Day Dawn service. They gave us two parking spaces. Friendly office staff.